the company. If you have signed up for the Intuit Wholesale Pricing program, billing responsibility for the QBO company you create becomes a matter of choice: You can pay for the client’s subscription and then bill the client back for the cost of the subscription. 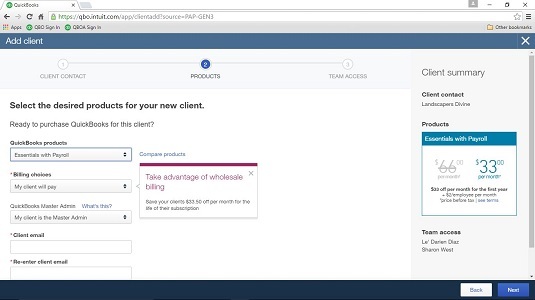 At the present time (this could change in the future), if a QBO client wants to remove an accountant, the firm managing the client’s Wholesale Billing subscription must first remove the client from Wholesale Billing, even if the accountant the QBO client wants to remove is not affiliated with the firm managing the client’s QBO subscription. In QBOA, click Gear → Your Account. Your Account appears in the Your Company column of the Gear menu. In the Your Accountant window, scroll down to the Wholesale clients section and click the company you wish to remove from wholesale billing. From the Actions column drop-down, click Remove from Wholesale. Click Clients in the Navigation bar to make sure you’re displaying the Client List page. From the Client List page, click the Add Client button in the upper right corner above the list. The Add Client wizard begins, and you see the Client Contact Info page. Provide a name for the new company. Optionally, supply other information on this screen. QBOA displays the QuickBooks Products page of the Add Client wizard. Click the QuickBooks Products list box to open the list and display the available QBO products. 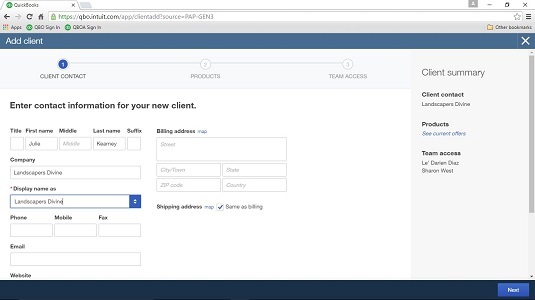 Select a QBO product for the client. You can choose Essentials, Essentials with Payroll, Essentials with Full Service Payroll, Plus, Plus with Payroll, or Plus with Full Service Payroll. After you select a product, the Billing Choices list box appears. Click the Billing Choices list box and select who will pay, who will be Master Administrator; and provide the Master Administrator’s e-mail address. QBOA displays the last screen of the wizard, where you select the members of your team who should have full administrative permissions when accessing the books of the client you’re adding. You can change access privileges later. QBOA does some work and creates the company, which appears in the list of companies on the Client List page.